Is it feeling crispy in the air where you are? I feel like we went from super hot summer to gorgeous fall just overnight. I love it, though, so I'm certainly not complaining! I have some special baby cards to share today. On Saturday, I became an Aunt for the first time! They live across the country and I hope I can visit soon. We sent out a baby care package and some sweet cards. This is the baby card we sent with our care package. I used the brand new "Baby Town" set from the Sweet Stamp Shop, which just released yesterday! I was inspired by a little animal mobile we bought, so I lined up the cute elephants in an arch/circle like a spinning mobile. The elephants were colored with Prismacolor Pencils and fussy cut. The blue elephant is emphasized by adding him to the card with foam adhesive. The papers are all coordinating patterns from DCWV "Little Mister" stack. 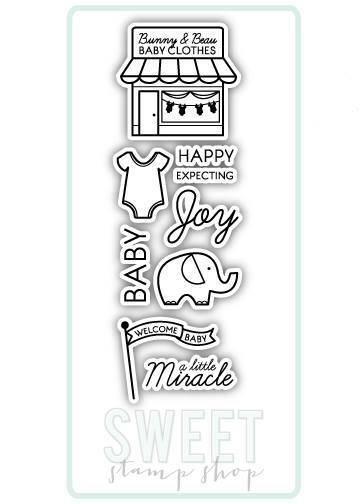 And of course all these adorable stamps are from Sweet Stamp Shop "Baby Town" set. I wanted to keep the card soft and delicate so I thought a large white doily would be the perfect accent. Those cute baby onesies were just asking to be hanging on a clothes line! A little tip: use mat glue along the top of the onesie and lay it on top of the twine. Line up all the onesies, spaced evenly, and let the glue dry. Now you have the ability to hang the twine however you want it on the card. The only place the twine is connected to the card is at the top of each end. Only the clothes are attached to the card with foam adhesive. This saves your card from being a hot gluey mess! Hey Rachel!! Congrats on becoming an Aunt for the first time!! I became an Aunt for the first time 8 years ago. I was so excited. My brothers and sister have been uncles and aunts for 16 years now so they were pros at it. I was the only one. Your cards are so fitting for the new baby. Amazing job. Ohh my those cards are adorable and congrats on becoming an aunt! Adorable cards!! And that Max is too cute!!! Congrats Auntie Rachel!!! Wow, the cards are too cute! Congrats Auntie..